Holy Like God ... how can we do it? But when Arlene got home and listened to the entire CD – she totally understood the reason for the sticker. Among the collection of songs with beautiful lyrics was one horrible song that dropped the “f-bomb” more times than Arlene could count. Why would an artist who had a gift for beautiful music decide to use his talent this way? It shocked Arlene, and she made sure to skip over the bad song whenever it came up. But there was something about the whole situation that didn’t sit right with her. And every time Arlene listened to the man’s CD, or tried to play his good song on her own guitar, she’d get a niggling sense of guilt that she just couldn’t shake. The whole thing made her a little angry and a bit confused. It wasn’t her fault the artist chose to put that song on her CD. So why was she feeling so bad about the whole thing? When Arlene and I were talking on the phone the other day, she asked me what I thought about it, and I told her about the “ultimate measuring test” scripture. You see, in John 10:10 it says that the devil comes only to steal, kill and destroy but Jesus gives life and life abundantly. When we applied this scripture to Arlene’s questions, it helped us get a pretty clear understanding of what we were dealing with. I asked her if the words in that song help bring abundant life to her regardless of whether she listened to it or not. Or, did they steal, kill and destroy? Arlene didn’t really need to reply to that one. She already knew the answer and quickly got off the phone to do what had to be done. Her CD had an appointment with her shredder. John was one of the biggest Def Leppard fans around when he was a young man. He loved the head-banging beat of the heavy metal band and had quite a collection of their CDs. And it wasn’t until John watched a documentary about the band that he began to feel conviction from the Holy Spirit. In the video, the band was blatantly and unashamedly open about their lyrics, and John realized that none of it lined up with his Christian faith. It was a long walk to the trash can the day John decided to throw away his treasured collection of Def Leppard CDs. John knew though that God was calling him to break the alliance he had with that type of music and it was a healthy step for his spiritual walk. Sometimes I think we wonder why we’re having trouble getting close to God, or why our relationship with him is stagnant. We can blame it on God – calling him distant and uncaring. Or maybe we blame in on ourselves figuring we’re just not the spiritual type. I wonder though if the problem lies with the type of things we let in our lives. Music, television and the Internet are filled with things that could separate us from God. You see, God longs to have an intimate relationship with us, but because of his holiness, he can’t flood us with himself when we’re filled with things that steal, kill and destroy. 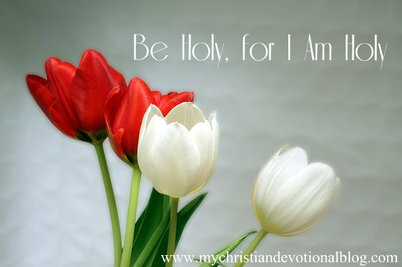 We serve a holy God, who calls us to be holy like him. Now, I know that seems like an impossible task – how could we ever achieve that kind of holiness, right? But you know, I think Arlene and John could tell you that path can start with something as simple as responding to the conviction of the Holy Spirit and “cleaning house” of things that separate us from him. It can be a tough decision to make, but isn’t enjoying the abundant life of Jesus Christ so worth it? 27 He has given Himself so that He can present the church as His radiant bride, unstained, unwrinkled, and unblemished—completely free from all impurity—holy and innocent before Him. 8 And a highway shall be there, and a way; and it shall be called the Holy Way. The unclean shall not pass over it, but it shall be for the redeemed; the wayfaring men, yes, the simple ones and fools, shall not err in it and lose their way.